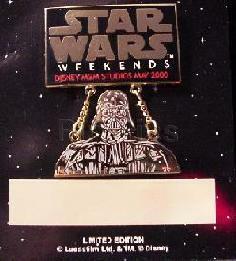 This was available at the Disney MGM Studios Star Wars weekends in May 2000. It was sold only on the 3rd weekend, Friday-Sunday. It is limited edition It has a black rectangle at the top with "Star Wars" in shiny gold, Weekends in white under that and Disney MGM Studios May 2000 in red under that (very small writing). Hanging in a dangle below the rectangle is the representation of Darth Vader , head and shoulders only, done in gold and white with some shadings. The shiny gold and detailing come up almost black on most scans.